We here at Candy Addict eat a lot of candy. 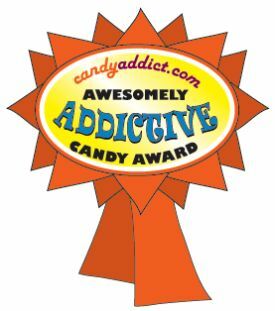 Over the past year, we’ve reviewed over 260 sweets and treats, but only 14 were deemed worthy of our highest honor: the CandyAddict.com Awesomely Addictive Candy Award, an award given to candies that truly stand out as being the best of the best. We don’t give this award lightly: this is the Gold Medal of Candy, and is only given to those delicious sweets that earn it. This year’s list includes something for everyone, in every price range, so if you’re looking for a great candy gift, this list is an excellent place to start. From chocolates to chews to sweet to sour to fancy to simple, we’ve got you covered. Every candy on this list is quite different from the next, but they all have one thing in common: they are Awesomely Addictive. I really want some of those M&M’s premiums but have seen them absolutely nowhere. I don’t always remember to check, but when I do, be it at Wal-Mart or Target or wherever, they don’t’ exist. Drives me a bit nutty. Or perhaps minty is a better word, because I want the mint chocolate ones I keep seeing ads for. Looks like I have some shopping to do! I’ve seen the M&M’s Premiums everywhere! I can’t recommend stores on the west coast, but in the Philadelphia area I see them at Acme (Albertson’s), Genuardi’s (Safeway), Giant, CVS, Walgreen’s, and Rite Aid. And Target and K-Mart. I’d try Walmart, too, maybe. They’re with the fancier candy pouches, not the bags of mini candies and regular M&M’s. I have to say, I tried one variety (mocha), and I found them very underwhelming. They’re such a small box and were still $4.00 on sale. A bigger bag of regular M&M’s can be had on sale for half that price. And I do think the regular ones are better. I didn’t care for the lack of the crispy candy shell. I just didn’t see anything premium about them (except for the price).